The peanut butter flavor is initially bold and interesting. It's a toastier peanut butter taste (think of a light spread of peanut butter on whole wheat toast). That flavor becomes less noticeable the more you eat. By the end of a bowl, the flavor is more like sweetened original Cheerios - which is fine in itself. If you want to really, really nit-pic, I'll admit to just the slightest bitterness in this cereal, especially in the initial spoonful (like when you add a tinge too much baking powder to a baked good). However, I think most people concentrate on the fun of the flavor, rather than on the shortcomings. If you like peanut butter cereals, you're probably going to like this new cereal. Honey Nut Cheerios still dominates as the most interesting flavor of Cheerios, but this new one is definitely worth a try. Nutritional Considerations: Each 3/4 cup serving has 110 calories, 1.5 grams total fat (0 saturated and 0 trans), 23 grams total carbs, 2 grams of dietary fiber, 9 grams sugar and 2 grams protein. 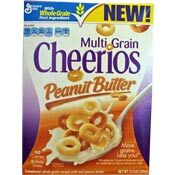 What do you think of Peanut Butter Multi Grain Cheerios? As a PB addict, I tried these today and was pretty disappointed. They are edible, but that is about the only thing good I can say about them. 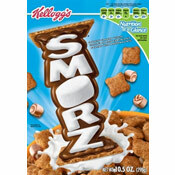 They are just too light and slightly bitter to even come close to making it onto my list of cereal standbys. One of my new favorites! Just enough peanut butter flavor and not too sweet. Love it. I love peanut butter, so of course I had to try these. All I can say about them is... I now have 10 boxes in my pantry because I bought all they had on the shelf the next day, and have gone through 2 boxes already. It is a more grown up version of the Cap'n Crunch peanut butter cereal. It does taste good, but leaves you with a greasy palette which lingers for hours. Not worth buying twice. I really like these. I've only bought one box so far though. They taste a lot like Peanut Butter Cap'n Crunch, but I feel a lot better eating these, health-wise. Very good to eat dry by the handful as a snack (like original Cheerios) but just doesn't taste that good with milk, IMHO. I actually don't care much for this cereal. It's not terrible, but compared to the goodness of Frosted Cheerios or Honey Nut Cheerios, this just doesn't cut it for me. I even prefer the original flavor of Cheerios to these. I definitely pick up on the bitterness Mr. Breakfast mentioned. I think that this cereal would have been better if they had just infused regular Cheerios with peanut butter flavor rather than going with the multi-grain version. It lacks the "oaty-ness" that usually makes Cheerios so tasty. Overall, it's edible, but I'd rather have Reese's Peanut Butter Puffs when I'm craving something peanut buttery. This is a top of the line peanut butter cereal in my opinion. Just bought my 2nd box DEELISH!! Under $3 at Wal-mart.